While Paranoia has its appeal and has even gotten critical acclaim for its black humor and compelling dystopian setting, Dungeon World takes one of the most cult games out there, Dungeons and Dragons, and turns it into one of the most entertaining and interactive gaming experiences available. Originally published in 1984, Paranoia often pits players against one another as they receive a number of instructions from a malevolent artificial intelligence known as The Computer. Each player is a Troubleshooter and the directions given by The Computer often result in each player having their own secret agenda. It’s a game that revels in parodying both traditional roleplaying games like Dungeons and Dragons and even its own darkly futuristic setting. Given that a reprint has just completed a successful Kickstarter campaign, it’s clear that Paranoia has a fairly passionate fan base of its own. For all its strengths as a different take on dystopian roleplaying, where Paranoia fails is when it comes up against a game like Dungeon World. 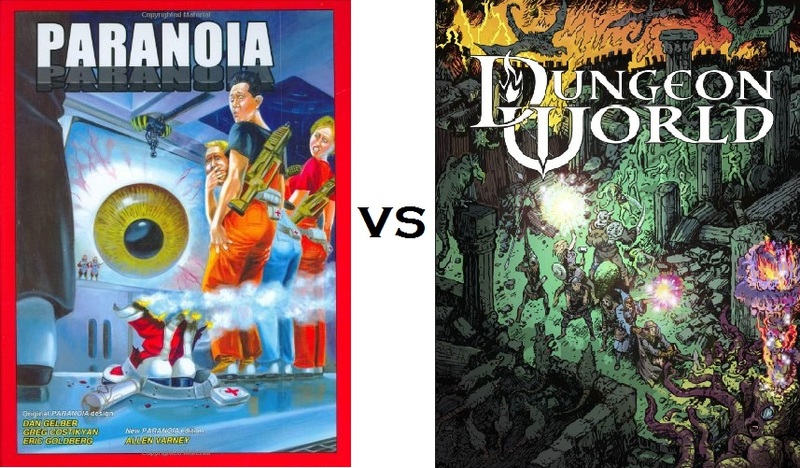 A much newer game than Paranoia, Dungeon World was published in 2012 and utilizes the same engine as the popular futuristic game Apocalypse World. Dungeon World is a highly interactive fantasy world which uses the mechanics and world of Dungeons and Dragons in a new way. I would argue that Dungeons and Dragons is the very definition of a cult game from whichever definition you want to use and that this cult popularity is part of what makes Dungeon World so successful. Despite the still present reputation of players as social misfits who sit in their parents’ basement and commit murder/suicide when their characters get killed, Dungeons and Dragons is still an incredibly popular game. What makes Dungeon World fantastic is that it takes the cult popularity of Dungeons and Dragons and improves it tenfold. Instead of just sitting around and rolling dice, each player is actively engaged in telling the story. The Dungeon Master provides enough detail to set the scene and then asks each of the players to provide background and motivation for the events which occur in each adventure. This not only ensures that each player is actively involved in every part of the story but also allows for creative solutions to any number of situations. You can have fun playing a competitive game like Paranoia but there’s nothing that compares to cooperatively crafting a fantasy story in which the wits, creativity and choices of you and your friends determine whether or not your character makes it to the end. The best part is that often they don’t and you end up with real consequences to your fantasy universe. Both Paranoia and Dungeon World are great cult tabletop RPGs. While Paranoia stakes its reputation on black humor and competitive play, Dungeon World has the great weight of the ultimate cult game, Dungeons and Dragons, coupled with a compelling new twist on the old standard. Dungeon World is the greater cult game because it involves players in a way in which no other tabletop RPG can match. The cooperative creation mechanic means that players feel intricately tied to one another and the story which they create in a way which garners it a dedicated and passionate fan base unmatched by other games. If you would like to read Kyle’s Take check it out here!